Organised tours are generally not my cup of tea…being herded from site to site, crushed under the hoofs of 50 pairs of sandaled feet that people seem to think is quite OK to wear white socks underneath, an expensive lunch stop that is generally a thrown-together buffet of ‘local food’….and repeating that mundane ‘getting to know you’ conversation that has you wishing you led a more interesting life….but today we embarked on a West island tour with the highly recommended Lido tours, and we didn’t regret it. Yes, it was hurried at times, but we weren’t led around any of the sights by a guide saying the same thing in German, French, Spanish and English while the herd completely ignores him or her. We were left to explore on our own, forge our own paths, however briefly. It wasn’t perfect, but it was an economical way to see the stunning west coast of the island and leave a taste in the mouth for wanting to come back and sample more one day in the future at a more leisurely pace. Our minivan picked us up first, then crawled around town for an hour picking up others – for the most part an elderly lot – for some reason Madeira has become known as ‘God’s waiting room’ amongst vacationing Brits….and it could only be Brits with their dark humour that could come up with such a brilliant description. Once all the cattle were on board we set off into the hills. 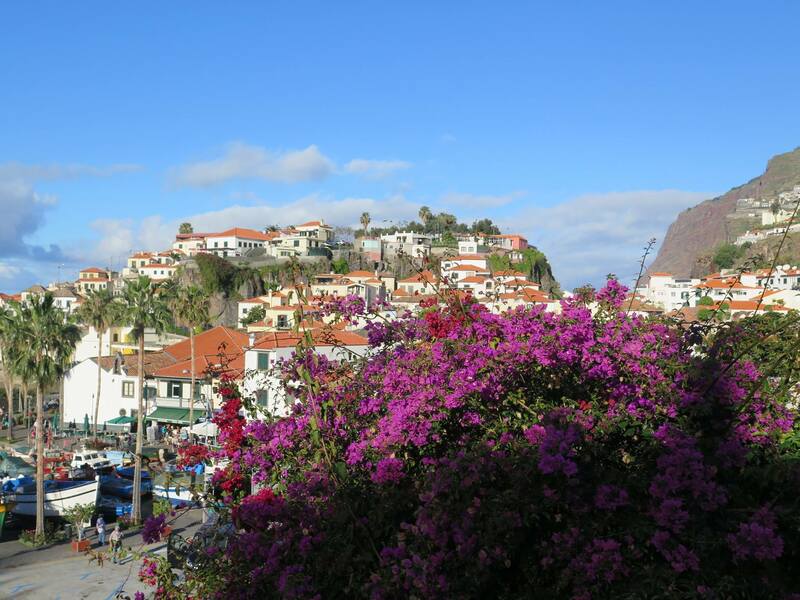 It was another gloriously sunny day…the weather in Madeira is lovely. Hot and fresh, like opening a bread oven. Our first stop was Camara Do Lobos, where apparently Winston Churchill spent time painting the lovely surrounds, something the old Brits on board seemed to take great pride in, whilst the Germans forced polite smiles. It’s a pretty fishing village, with a pretty church (every village and town seems to have a pretty church here). It seemed the ideal place to spend a morning or afternoon, just watching the village life unfold. From here we went to the incredible Cabo Girão, the second highest sea cliff in the world, and the highest in Europe. 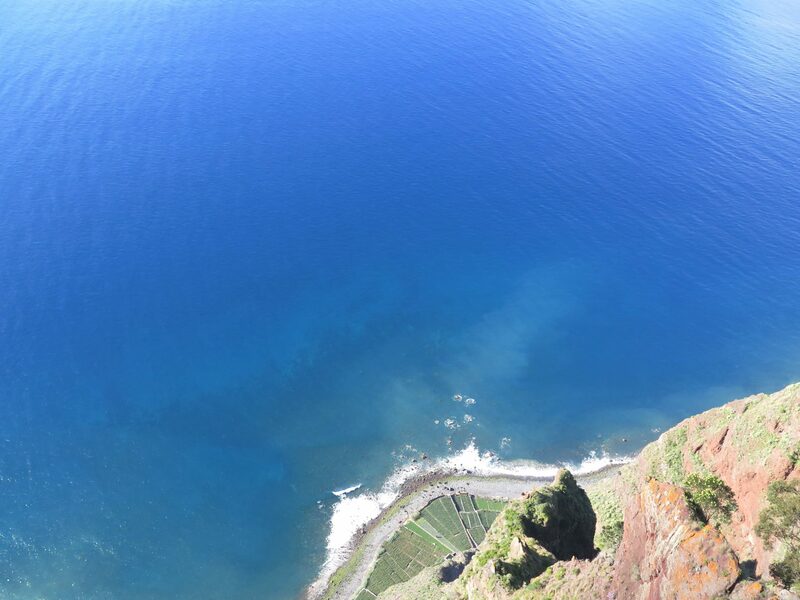 They’ve built a transparent skywalk here, and walking around the cliff ledges, with the rocks and the sea far below, and incredible vistas to the west and east, is an essential Madeira experience. 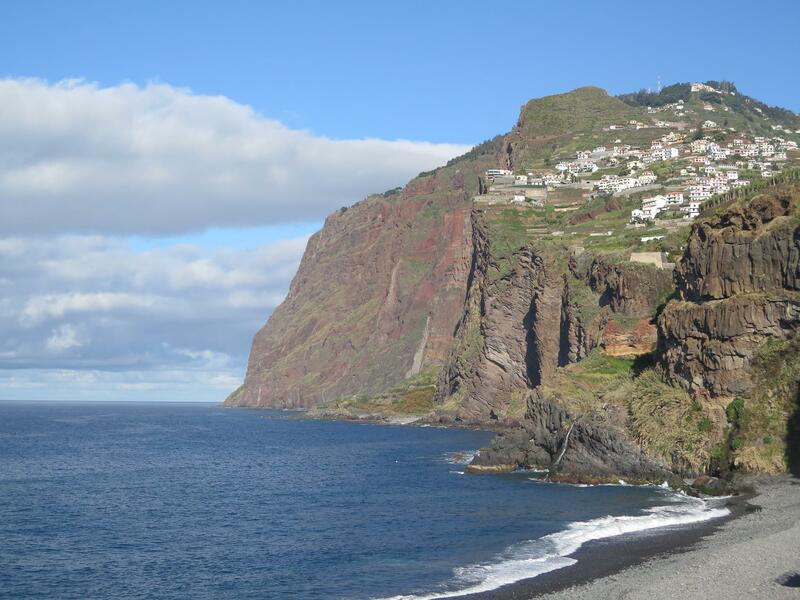 Ribeira Brava was next – a pleasant coastal town where Vero and I headed straight to a seaside cafe for a (for me) decaf coffee to help me take in the lovely views of the towering cliffs and the sapphire blue sea. Vero got talking to the waitress of the place….a Venezuelan woman who had met and married a local and had been living in this little town for the last 6 years. She stood out immediately for her friendliness, her warmth….and within seconds she and Vero were chatting away like old friends in that incredible manner of South Americans of instantly connecting with each other. The minibus now climbed up through the steep, deep, and narrow valleys of Serra D’ Agua, the views more and more spectacular as we went along. There was a viewpoint here, at Encumeada, where we were lucky enough to be able to see both the south and north coast of Madeira. We were also lucky enough to find the souvenir stall also sold passionfruit poncha, and so we had one each. It had a kick to it, so we had another. Now we headed along the rugged northern coast and came to the village of Sao Vicente – yet another quaint and lovely place with a pretty church. Porto Moniz was next – and the highlight of the trip, from the pure powerful scenery on the drive here to the icy dip in the natural pool. 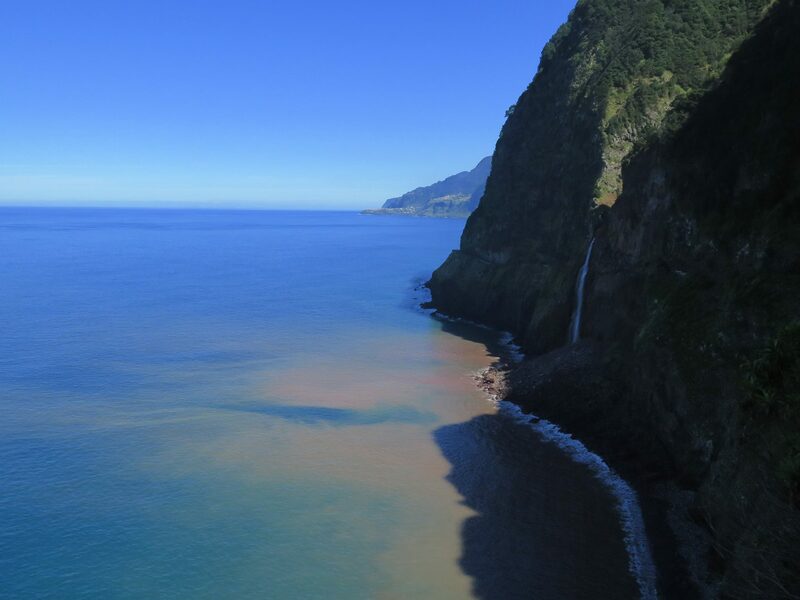 These are where you can find the most spectacular natural pools in Madeira. After a quick sandwich and a beer, Vero and I paid the small entry fee and experienced something quite different. The Atlantic is cold. Bloody cold, but calm, in these natural pools. The Atlantic gives you a chance to enjoy it’s icy freshness here. And you get used to the chill, and start to warm up after a minute or two. The place was full of pale white tourists from all over Europe, and a smattering of olive-skinned Portuguese, Spanish and Italians who just look beautiful and cool in comparison. Bronzed and shiny….I felt suddenly self-conscious and sank further into the depths of the pools while Vero basked on the rocks, one of the lucky naturally bronzed. Our final stop was in Seixal, and the incredible Miradouro Veu da Noiva, which commands an impressive view of green cliffs, the brilliant blue ocean, and a distant waterfall….yet another spectacular view to end the incredible day trip. 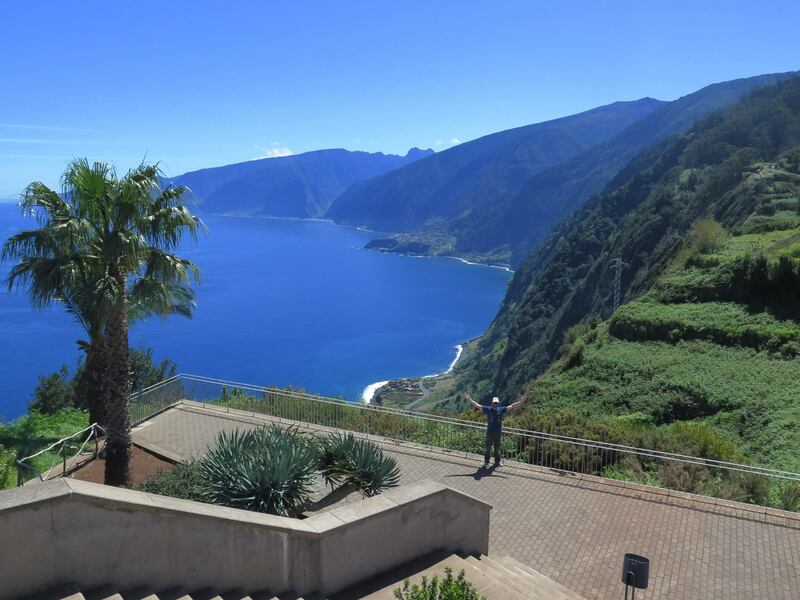 Madeira truly is a spectacularly beautiful island. That evening we went to a different area of town, just up the hill from Funchal. A place of English and Irish pubs, of curry houses, kebab shops, and sunburnt Brits who can’t possibly spend a few days in a foreign country without such creature comforts. I had a guinness at the Irish place. I can’t live without some things either. We found a nice rooftop bar where a South African woman had carved out a career for herself singing along to instrumental recordings of pop songs. She was very friendly, tried hard to involve the crowd (me and Vero) and get them to sing along…and created a fun and holiday atmosphere. We had a couple of Coral lagers, and then called it a night. A wonderful day.